Dragalia Lost: Has Nintendo figured out Free-to-Play? Not too long ago, Nintendo vowed to never make mobile free to play games. Their own hardware is too important, the “Nintendo-factor” incompatible with free to play games. First, they yielded on hardware, with the release of Mario and then on free to play through collaborating with Niantic, creating the superhit Pokemon Go. A patchy success history followed, with some projects like Fire Emblem Heroes becoming hits, and others, like Pokemon Quest and Animal Crossing, opportunities to learn. Is Dragalia Lost proof that Nintendo can achieve continuous success on mobile or another missed opportunity? Both Pokemon Go and Fire Emblem Heroes are seen as something of a surprise hit, vastly outperforming expectations. Dragalia Lost, in turn, is a much more predictable marriage, with free to play ancient Cygames (of Rage of Bahamut fame) adding tried and proven monetization design and expert systems knowledge to Nintendo’s famous world building and quality standards. Written by Florian Ziegler, who just recently started up his consultancy Lava Lake; with additions by Adam Telfer. How well is Dragalia Lost doing? Dragalia Lost has had a weird launch approach. Rather than launch in minor market that behave similar to their major markets (ex. Canada, Australia), Nintendo launched Dragalia in Japan, Hong Kong, and the US first. A bold soft launch, but one where they will clearly see the success of the game. Thus far, roughly 40 days from launch, the game initially peaked on the US Top Grossing charts, but has since fallen. Now it is still falling from the Top 250 Grossing. In the US, Dragalia Lost had a very strong launch, but is already fading from the grossing charts. While in the US the game is fading fast, this game looks to be a new staple on the Japanese Top Grossing charts. Yet what sends signals that this game may be a contender is that these grossing ranks have sustained despite the game dropping off significantly in downloads. This is a soft launch, not a global launch, so it’s unlikely that Nintendo have put much effort into marketing the game yet. As of now, Sensor Tower estimates that the game has racked up over 2 million downloads in soft launch, but has already generated over $27 million. Surprisingly, the game is actually hitting roughly the same per user numbers at this point is a strong indicator of success. So it’s likely that even though the game is fading from the top grossing charts in the US, the game is actually performing well on a per-user basis. So the real question is — can Nintendo effectively grow this game to the same size as Fire Emblem Heroes? Can Nintendo repeat the success of Fire Emblem with a brand new IP? Dragalia Lost takes players into a familiar world of high fantasy, in which humans form special bonds with dragons to enhance their powers. Unlike previous Nintendo titles, Dragalia is an entirely new IP, relying entirely on the high-quality characters and beautifully crafted experience to draw players in. Dragalia’s action phase is a top-down 3D action RPG game. Players can use a single tap to attack, move their thumb to steer and trigger special abilities of their characters or their dragon form. The gameplay is very similar to pre-idle period mobile action RPGs like White Cat Project, with an optional “auto” button that essentially turns it into Nonstop Knight. All of it is easily played with one hand and one finger in portrait mode, making it highly accessible. Auto gameplay is relatively efficient, and if you have the needed meta power you only have to trigger abilities when they are ready and otherwise watch the game play out. Taking manual control is only useful to maximize the rewards from treasure boxes that are sometimes out of the way of the AI combat path, or for special bosses that require more thoughtful positioning and dodging than the control algorithms are capable of. All in all, the combat is casual enough to be left alone, but has the potential for deep boss raid gameplay, which the game offers to engaged players. Already completed grind battles can be skipped with skip tickets, which are not monetized. As the junction between action phase and metagame, the pre-battle phase is where players determine their team strategy and loadout. Key to winning is the elemental alignment of the characters (fire, water, wind, dark and light), and how it corresponds to the battle at hand. Another factor is the character’s class (attack, support, defense, and healing), and associated weapon (sword, axe, dagger, saber, lance, bow, staff and wand). As the combat allows for this kind of depth, badly constructed teams (such as all support characters) tend to fail frequently, giving players another reason to maintain a large roster of characters. With four characters, each with three potential slots (weapon, Wymprint and dragon form), making the right choice can be a complicated undertaking. Cygames has, however, simplified the process massively by giving you an optimization button that tailors the setup to whatever is the most effective elemental setup at hand. This means the amount of character and item management is massively reduced compared to other games of this type. 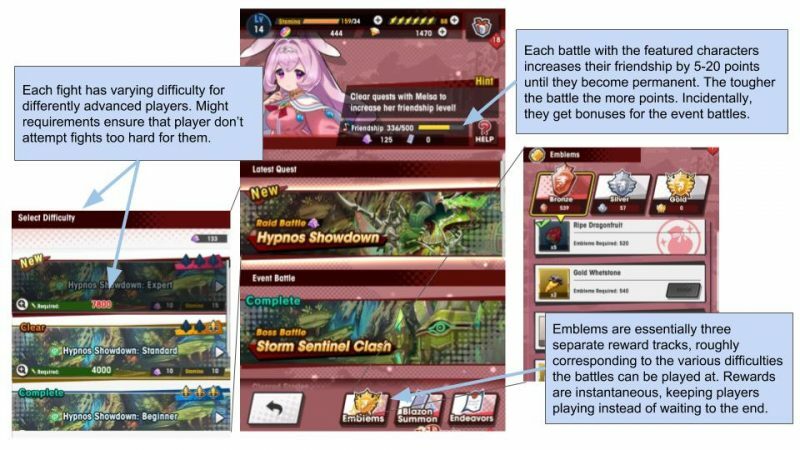 Gacha RPGs essentially run on their system design, and from a systems standpoint, Dragalia is a massive game. To understand how it can generate the staggering $15 ARPI per player, the best way is to showcase the immense breadth and depth of its progression system. That’s a lot of game! We will go through these systems one by one to explain how they work. Players acquire adventurers from events and the gacha system, ranging from 3-5 stars in rarity. Adventurers have one of five elements (wind, fire, water, dark and light), and can each be equipped with a weapon, a Wyrmprint (essentially an upgradable ability) and a dragon form into which they can morph during battle. Adventurers gain XP by battling, but can also be levelled with an XP currency called crystals. Duplicate adventurers are converted to Eldwater, which in turn allows 3 and 4 star adventurers to be “unbound” meaning they can become 4 and 5 stars respectively. Additionally, each adventurer has a “mana circle” which is essentially a character’s skill tree. It unlocks stat bonuses and skills, and it, too can be “unbound” using special materials only found on certain recurring weekday events. The amount of mana circles (and hence power options) depends on rarity, and lower rarity characters need significant amounts of investment to break their limits to unlock them. Adventurer’s can turn into dragons for a limited time during combat, giving them strong power increases and new special abilities. Dragons can be levelled using a special dragonfruit currency to increase their power up to a certain level cap. Getting duplicates of a dragon allows the dragon to be “limit-broken”, meaning they can now have a higher level limit cap for further upgrading. As an additional action, players can visit their dragon’s roost and give them gifts in the form of Rupies (Dragalia’s soft currency). In turn, the bond strengthens, which gives the player more time to use the dragon form. The dragon returns the gift by bestowing random item rewards onto the player. Dragons have individual elemental alignments, and it is possible to give a fire adventurer a water dragon, in case a player cannot muster the right high-level elemental fighters for a specific challenge. Wyrmprints are equippable trading cards that add or alter the adventurers ability. They, too, can be levelled using their own currency and limit broken with gacha duplicates. This means that to fully level up a 5 star top rarity Wyrmprint, you would need to acquire four duplicates (appearance rate of a specific 5 star Wyrmprint is 0.083% at the time of writing) and then acquire enough specific levelling materials or dud Wyrmcards to feed into them to level them up. Some Wyrmcards are event specific (such as the anti-boss card shown above) and are needed to get the necessary horsepower to beat the bosses at highest levels, creating the need to go through the entire journey to max out an item that is not very useful outside the event. This is a powerful way to monetize whales that have all other standard game content already. Like dragons, they can be equipped onto any character, but usually inherently are the right choice for certain classes (such as bestowing healing bonuses onto healers). Weapons can be found or crafted, and are not found in the main gacha. Crafting them requires rare materials that players have to grind, gacha or purchase. Just like dragons and Wyrmprints, they are levelled and limit broken with their own currencies. Rare elemental versions of weapons can be created, which give 50% damage bonuses to characters of the same alignment. The 4 star and 5 star versions of the elemental weapons tend to be very hard to craft, with very rare materials involved, but crucial to late game success. Being able to craft these high level weapon in the first place is dependent on the Smithy building in the Halidom.As a further connection between Halidom and the weapons system, after a substantial amount of time in the campaign, Dojos can be built to give buffs to your various weapons. Dependence of the weapon system on the kingdom builder part of Dragalia forces players to have a steady predictable progression metaphor that is based on time, not random drops, until they can craft endgame items. The Halidom is a kingdom builder, and plays by the standard rules of builder conventions. Buildings costs soft currency, time and sometimes crafting materials to build, and there are a limited amount of builders. Building can be finished up quickly for hard currency. Buildings generate resources that can be collected when they are full, and unlock certain features in the game (such as weapon crafting). Some of the buildings buff your weapons’ and adventurers’ combat power across the board, making progression in the Halidom a long term necessity. On top of that the economic gains the player requires towards higher levels make the return-to-collect mechanic a great retention driver. 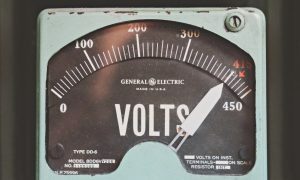 Why have all these parallel systems? As you can see, Dragalia Lost contains a character gacha game, a trading card system, a castle builder, a crafting system and dragon pets, each with their own upgrade paths. Each system is important to progression, none can be left behind to stay competitive. This abundance of systems is Dragalia Lost’s greatest asset, but also likely its greatest curse. From the perspective of a developer, this is great. The monetization breadth and depth is incredible, and one of the reasons that players engaged in Dragalia Lost are spending so much money in the game for long periods of time. By leveraging almost every successful power progression mechanic known to man, Cysoft has created a large playground to tweak, leverage and incentivize the economy of the game and give players more reasons to spend, and for longer. Mind that each of these sub-economies are in themselves closed, meaning that (for the most part) the resources required in each of these economies are only used there and nowhere else, making a system of this magnitude mangeable. Each one of them can be altered without affecting the others. From a player perspective, this approach has its drawbacks, and that becomes evident when comparing the Japanese and US American market. The Japanese are used to highly complex systems and multi-faceted progression mechanics. This is the most likely reason for the big difference in ARPI. The western mid-core audience just doesn’t have the complexity appetite for this many parallel systems. Even Fire Emblem Heroes does not have so many granular avenues to power. 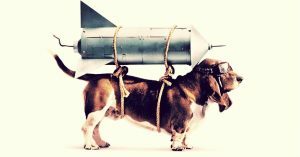 In my opinion, the main reason for the success difference is the progression complexity, in which the best path to power is not necessarily clear. Players that are more used to straightforward and easily accessible power progression will be turned off. The plethora of progression systems is but one pillar of Dragalia Lost’s highly monetizing player profile. Cygames’ reliance on a randomized reward system is the other. There is rarely such a thing as a predictable reward in Dragalia. Centrepiece of all character gacha games, Cygames’ main gacha cleverly extends the pool of gacha content by adding Wyrmprints and Dragons to the mix. There are 70 launch characters, a base upon which other games could build their entire game, plus 40 dragons and almost 80 Wyrmprints (190 droppable pieces in total). While some of these are currently event-only, the amount of content for the base gacha is staggering, particularly as Wyrmprints and Dragons require many duplicates to be useful in the long run, and can only be equipped on one character! The large amount of content allows Cygames to be very generous in offering players spins on the gacha, and hence hooking them to the mechanic. Adding to that, Cygames also applies a “pity mechanic” that increases the chances of pulling a 5 star item (character or otherwise) after a certain amount of summons without 5 star success. This prevents spender churn due to perceived lack of fairness. 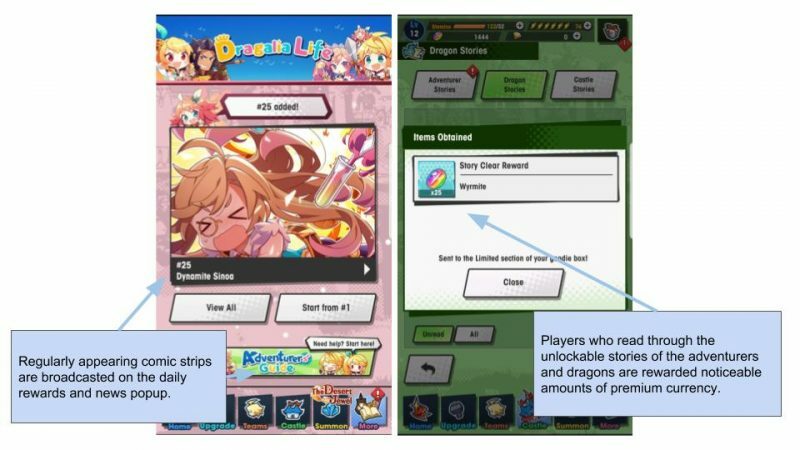 While both of these methods sound generous, the chance of getting a rare Wyrmprint is still twice that of a character, and many players end up with these instead of their true desires. 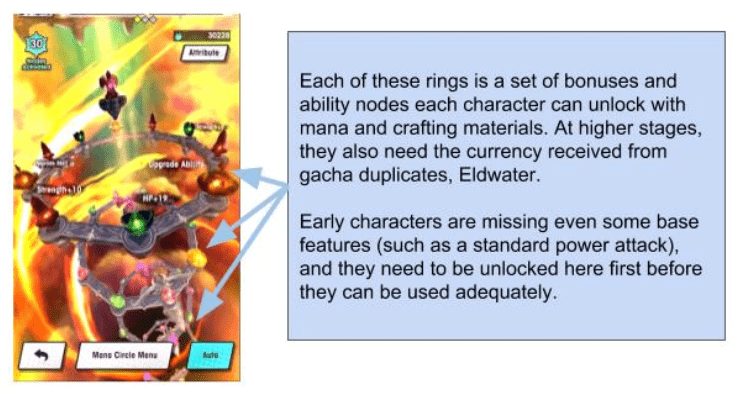 Duplicates can be fed as XP boosters to their own kind, with the exception of characters, who are substituted by a currency called Eldwater, which is used to promote lower characters to a higher rarity and unlock high level skill boosts in mana circles. What is important to note is that at of yet, there’s no endless sink for Eldwater, meaning that at some point the currency becomes useless to high spenders – I will talk about this again in the live service segment. A crafty way to turn more players into payers is the structure of the gacha summons: a single summon is 150 Wyrmite or Diamantium, the ten-fold summon at 1500 Wyrmite/Diamantium guarantees a 4 star item. The daily single summon ,however, only costs 30 diamantium, meaning that the paid-for premium currency is vastly superior when used in daily trickles, keeping spenders playing! Since players are in constant need of a variety of currencies and crafting materials, they get a free spin at the item gacha, which returns a small amount of them. Conveniently living in the shop, this daily habit makes sure players are exposed to any special deals they might want to make use of – or to buy the missing ingredients they hope the item gacha would return. The item gacha fulfills two important purposes: the first one is to get players to visit the in-game shop daily and come in contact with all potential purchasing offers. The second is to ensure that players can’t miss out entirely on anything they might need in case they lose overview of the system, or have trouble grinding. Dispensing all types of the commonly needed progression resources, it ensures a minimum amount of power growth, even if a player isn’t fully efficient. Each time a player fights a battle, they receive a few consistent resources: rupies and mana. On top of this, each level has a drop table of random rewards, that includes weapons and even low-level Wyrmprints. So to find the more tertiary resources only found in drop tables, players need to not only select the right level and fight difficulty, but also get lucky. There is a small skill component to battle rewards in the form of treasure chests that can be found during battle for going out of one’s way, but their contribution to overall results is relatively minor. If players need to desperately acquire a certain resource, they have the choice to either fight for randomized these rewards and potentially spend on stamina refills, or they have to buy these resources in shop packs and the item gacha. Knowing what is the best way to acquire an item, and consequently where to spend most efficiently, is often not clear. This reduces the appeal for players who are used to easily understood power growth, and who are time poor. At 40 Wyrmite for a stamina recovery, 50 (base) Wyrmite cost for an item summon, or around 30 USD for a pack that contains the item, Dragalia does not make acquiring an distinct item a straightforward purchase decision, either. When gifting to Dragons (which costs Rupies or special purpose items), they offer a random set of goodies in return, along with their increase in dragon bond. 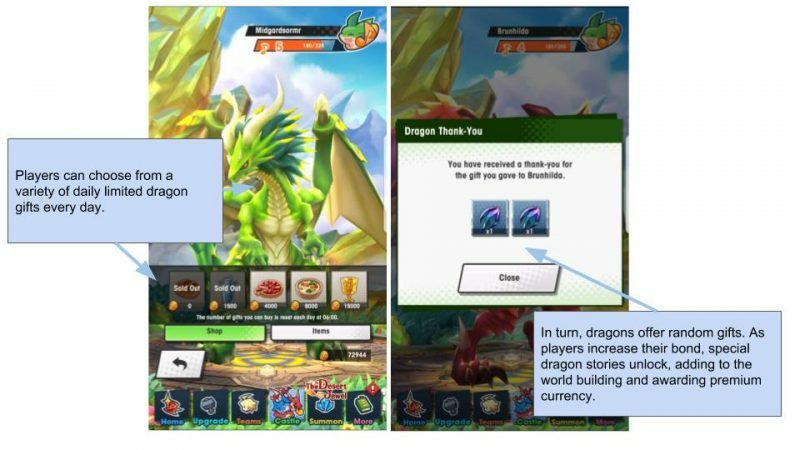 Since Dragon gifts are not very predictable or good return of investment, they are not a good way for the player to advance their progress. However, Talonstones, as pictured above, are given at certain bond levels, which makes leveling dragons relevant at specific points in the upgrade journey. If the recent events are anything to go by, Cygames are offering a special gacha type for their unique events. 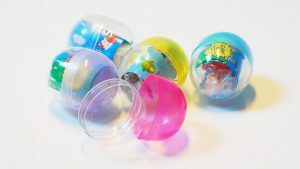 Unlike the other gachas, however, it is a finite gacha (also called box gacha), meaning that once an item is taken out of the pool, it cannot be rolled again. Players get full visibility on the current contents, and are even allowed to reset it, putting things back into the pool. This allows players some influence on whether they want the remaining items guaranteed or have another chance at getting the super rare drops, assuming they have already been removed from the pool. Having this much of player progression be determined by randomized rewards systems allows for many more spending opportunities and make it easier to obfuscate balancing changes. There are two main ways in which Cygames currently keeps the game fresh and their players engaged: Gacha events and limited time special events. Gacha events are large-banner introductions of new characters and items to the common gacha pool. These characters have a highly increased chance of appearing (currently 0.5% instead of 0.05% for other 5 star characters) and are particularly suited to whatever the current special event challenges at hand are. Oddly, Cygames makes no direct reference to enforce this connection, showcasing how the game accepts that players have to figure everything out by themselves, bleeding even into their monetization methods. An engagement mode, where a new character is introduced that players are given to play with for free. This character only stays if players have won enough fights with them to increase their “friendship level” to maximum. Event fights give more points. This segment is achievable for all engaged players to complete. Boss Battles can be completed on their own or in coop mode and hence allow players who do not want or are not able to participate in synchronous coop to earn event gacha currency, emblems (engagement rewards) and raid access tickets. Raid Battles are coop raids only, with four players bringing in whole teams of four characters each! This is where players can earn the highest tier gold emblems and hence the best rewards. Coop raids cost special stamina AND require the access currency from the Boss Battles, making them real stamina pinches, particularly since grinding high amounts of access currency will also cost stamina. The true end rewards of the special event are multiple copies of the featured 5 star dragon, summoning vouchers for free gacha pulls, ultra-rare items needed for highest mana circles, “joker” items that can unbind any dragon or rare weapon ingredients. Because all of these items are either event exclusive or barely obtainable by other means, events are a necessity for top players. Not performing well in events affects their core game performance, causing them to be heavily invested in these social coop raids. 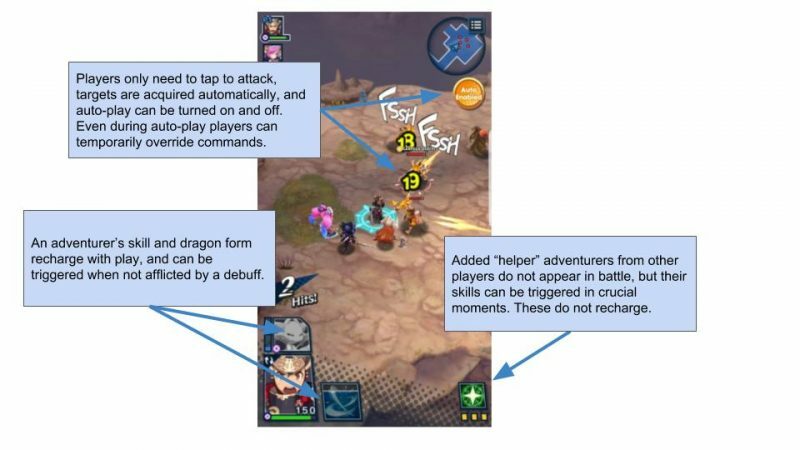 The current systems design and live service model of Dragalia will likely lead to difficult endgame management. First there is the fact that in absence of a mode that creates content on its own (such a PVP mode), players who have all or most of the standard content have nowhere to meaningfully play. There aren’t even leaderboards for the most event victories or any other measure of competitive success or dedication that keeps top players pushing. The only motivation that keeps top players in the game is collection of future characters. This system means that future events either always need to yield the new most powerful character (power creep) or monetization will decline as players have no power-driven motivation to acquire them. Secondly, duplicates including the substitute currency for characters, Eldwater, do not have an endless sink. This means that further spins on the gacha are a waste of money and literally return zero game state change. Top players will end up with large quantities of barren items und currency stocked up, making them precarious for use by the liveops team in the future. 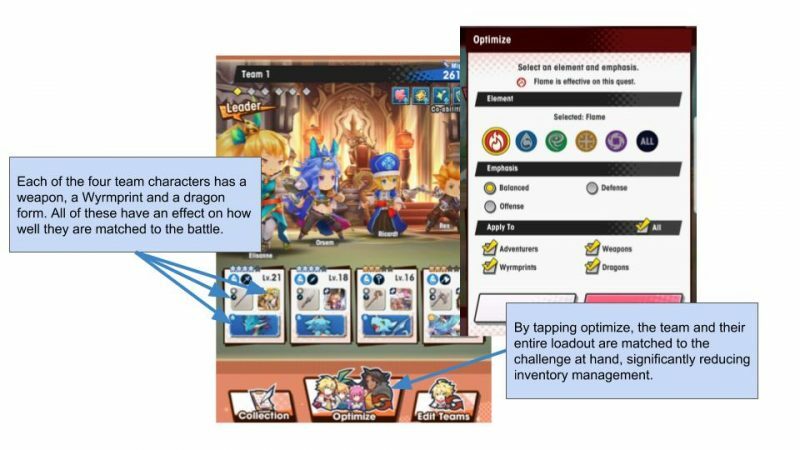 Both the gameplay and the systems economy in Dragalia have distinct endpoints. Currently the solution seems to be to make the top resource acquisition incredibly grindy, which is another feature that will reduce long term appeal in the West. One of the first things you will notice playing Dragalia Lost is how generous it is with dispensing its premium currency Wyrmite. You literally get it for everything from fighting battles, to completing dailies, to simply reading the stories of the various characters. 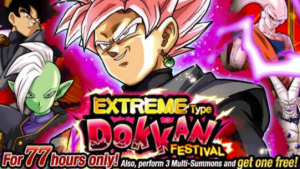 Usually you can get enough to complete a multi-summon every day or two. There are three reasons Dragalia hands out its premium currency so freely compared to most western games. In my opinion this is something that the Japanese developers, who first introduced this system to the mobile market, have always done better than their western counterparts: For a gacha game to truly work, gacha must be the habitual center of the game. Everything revolves around the gacha, and players must get used to it being the prime source of their progress first. To that end, sacrificing some early monetization to have people spend more in the long term is an acceptable trade-off. Mid-core games (Japanese-made in particular) tend to be complex affairs with many features, taps and sinks. Since most midcore games rely on good long term retention to make use of their feature depth, heavily incentivizing players to stick with the game until they have learned the ropes and are committed is beneficial. The high granularity of Wyrmite (1500 for a multi-summon) allows the team to trickle small amounts everywhere to incentivize behaviours. Because the currency is so valuable players can easily be directed towards the features deemed most important. As an example, playing socially with new players in coop mode will yield a staggering 150 Wyrmite per fight. Traditionally, most of these ultra generous reward streams will bleed dry as the players venture deeper into the game, and Dragalia Lost is no different – many of these rewards are for first time completion only. Add to that the fact that each gacha is diminishing returns as your power demands grow in the game, needing more and more more Wyrmite to make a power difference, and it becomes clear that this generosity is deceiving. In a world where synchronous PVP and guild play are the buzzwords of the day, Dragalia Lost feels strangely oldschool. Relying on what is the gold standard of Japanese social features since Puzzle and Dragons, players can take the hero character of another randomly selected player into any battle to help them out. Repeated use of the same player’s character “befriends” that player, but it has little consequence beyond allowing more frequent use of their special ability. 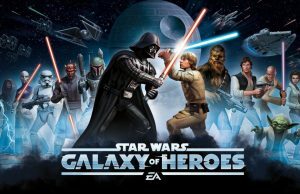 While it appears as a social feature, it’s mostly a showcase for more powerful characters and a potential monetization driver. Dragalia does not have a PVP system, and seemingly no plans to introduce one in the near future. Whether that was by design to take monetization pressure off to cater to the Nintendo feeling, or simply due to time and budget constraints, or because games like Dungeon Hunter had failed implementing it successfully before, one can only speculate. What is fact, however, is that Cygames have decided to double down on coop gaming. Almost every battle, whether campaign or event, can be fought in synchronous coop mode with other players. Some modes only allow one hero (of four), others feature multi-team raids of 12 characters. Coop follows a classical lobby system, with all its drawback of waiting and dud players. Dragalia really, really wants you to play coop, presumably because it lacks both PVP and other forms of social organisation. Not only is coop mode front and center in most battle screens, but each time you play with a new player, you get a maximum of 150 Wyrmite until you reach a (invisible) cap of several thousand. This high incentivization means that coop is the most economically important part for players to engage with every day until they are deeply invested in the game. On top of that, the best event rewards are only in coop raids, forcing even solitary players to play socially to advance their game state. Considering that group raids are one of the most well-loved and most engaging elements of a whole slate of multiplayer RPGs (most famously World of Warcraft), it could well be a viable strategy to cut out the player finding and guild management and create a frictionless social raid PvE endgame. High quality comic strips playing out in the world of Dragalia are regularly added to the game. Players are awarded substantial amounts of premium currency to read through each character’s story, encouraging players to get deeply invested into the world of Dragalia Lost. 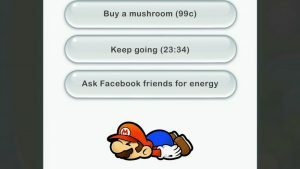 This way Nintendo sets about creating the necessary super-fans to build a new brand from scratch that has lasting appeal. Dragalia is probably one of the most polished mobile titles I have ever seen. Everything oozes the quality and polish you expect from a Nintendo game: from the fully voice-overed cast to the gorgeous card illustrations and expert J-Pop tunes, Dragalia Lost is a joy to behold and play. But this polish isn’t constrained to its visuals. Cygames deploys the latest and greatest of Japanese mobile systems design, and provides one of the most accessible versions of JRPG style mobile meta designs to date. Yet so far financial differences in the US compared to the Japanese market make clear that improving accessibility alone is not enough to wean western gamers to these highly complex systems en masse. Its focus on coop play over guild and PVP systems is a bold choice, but one that will bite twice: firstly for leaving competitive player types stranded and secondly for putting the game firmly on a event-driven content treadmill. Because the game currently has no truly endless, self-content creating mode there’s a high chance it will run out of steam for high performing top spenders. After all, there’s only so many adventurers, Wyrmprints and weapons you can find and upgrade – after that, you are just waiting for the next event and the next character to collect. Character collection is the endgame of Dragalia, and collection game players only make for a fraction of possible player types in the west. Cygames is relying too much on Japanese design staples, using a highly refined version of what’s tried and proven features in free to play JRPGs for almost a decade. Clearly efforts were made to make the game more appealing to Western audiences, but it still relies too much on intrinsic player effort to understand and manage all of its complexities. A clearer path to power and a monetization approach that responds to the player state, such as targeted offers, would substantially increase player investment in Western countries. Without more understandable power growth, more accessible systems and a dynamic monetization design, Dragalia Lost will likely be “just” another Japanese hit. Yet, even that is a huge step forward for Nintendo on its way to be on mobile what it is for the world of console games. Guest Post by Florian Ziegler, who just recently started up his consultancy Lava Lake; with additions by Adam Telfer.